Its that time of year again and I’m joining Gillian in reflecting on the hits, misses, inspirations and goals of 2013. I love doing this, it’s a helpful process and helps me work out what direction I want to go in for the next year. This post I am looking at my hits and misses. 1 – I made Coats! My two coats – The Anise and the Jackie. Two very different coats and I made plenty of mistakes but I produced two wearable, warm and well fitted coats for winter this year. My main errors related to interfacing issues and it was a fabulous learning curve to undertake these two projects back to back. I only made these two dresses recently but I love the fit of both the straight skirt view and also the flared skirt. This is a really popular pattern and now I know why. Both these dresses are on high rotation in my wardrobe. There are so many variations in the pattern I will easily be able to make a couple more of these without looking samey. I made a lot of skirts this year. My favourites all have some kind of flouncy detail. These four have been worn the most. I really like McCalls 5523, which has a number of variations, it has a lovely fit and is probably my TNT princess seamed skirt. 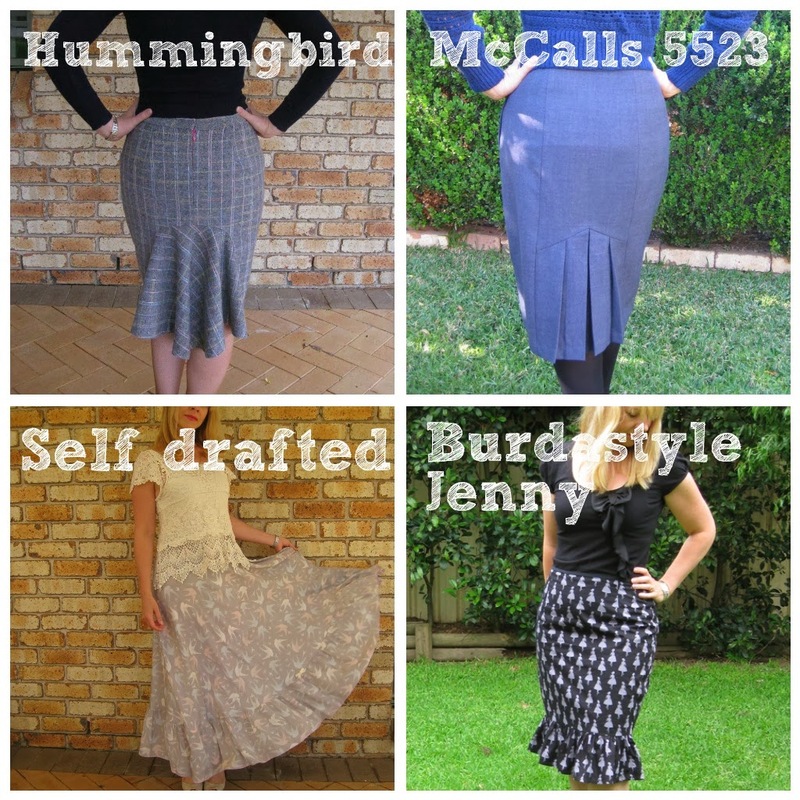 The Burdastyle Jenny continues to be my TNT pencil skirt pattern, I’ve made it several times and love it. 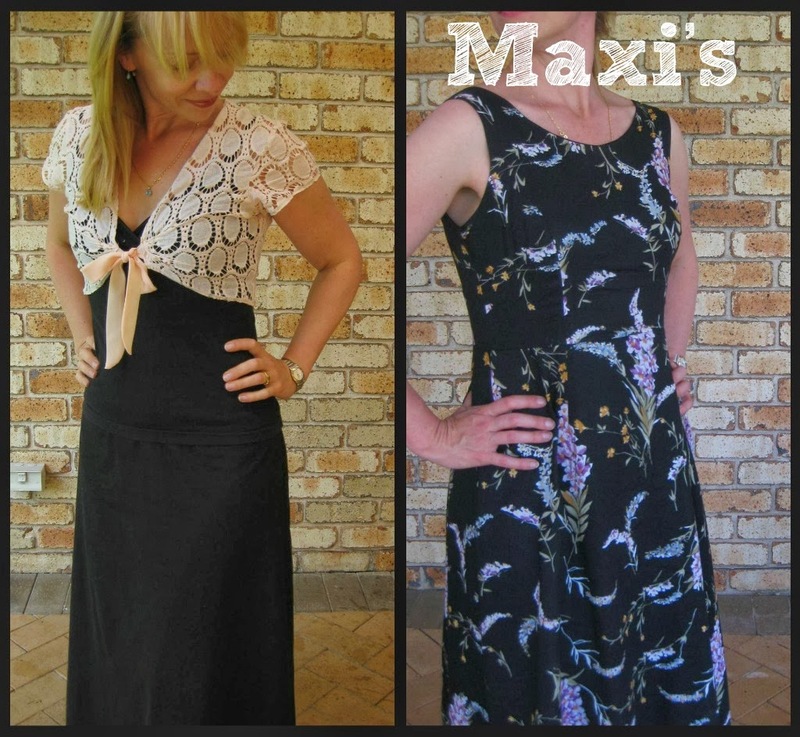 4 – Maxi’s for everyday wear. These two items have been worn constantly since I made them. They are so practical for everyday wear and really suit my casual style. 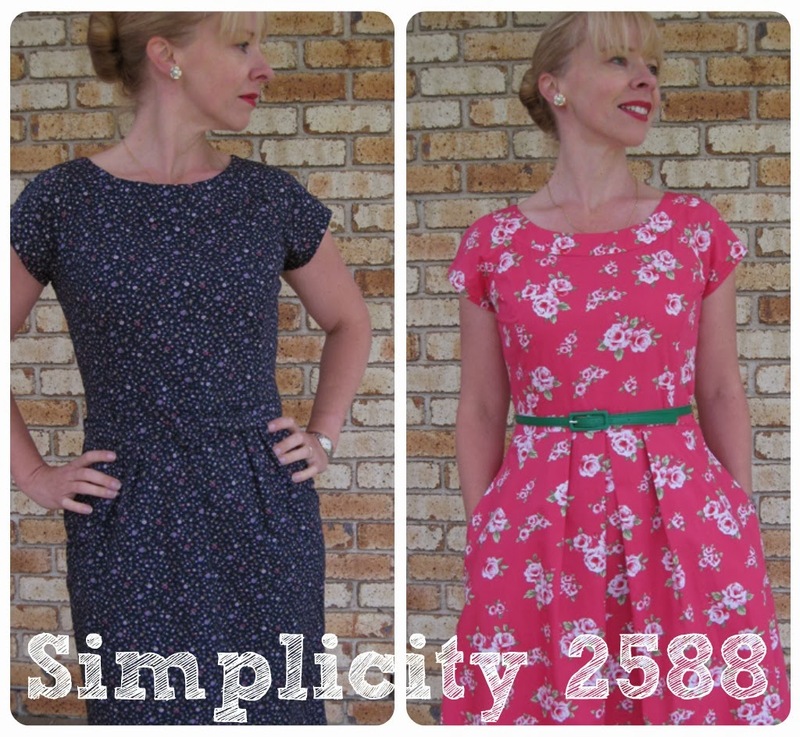 A black maxi version of Simplicity 9825 and the Elisalex maxi dress. I’ll be making more of these kind of thing. This dress was a never worn item, which was rather heart breaking considering the enormous number of hours that went into crocheting this dress. 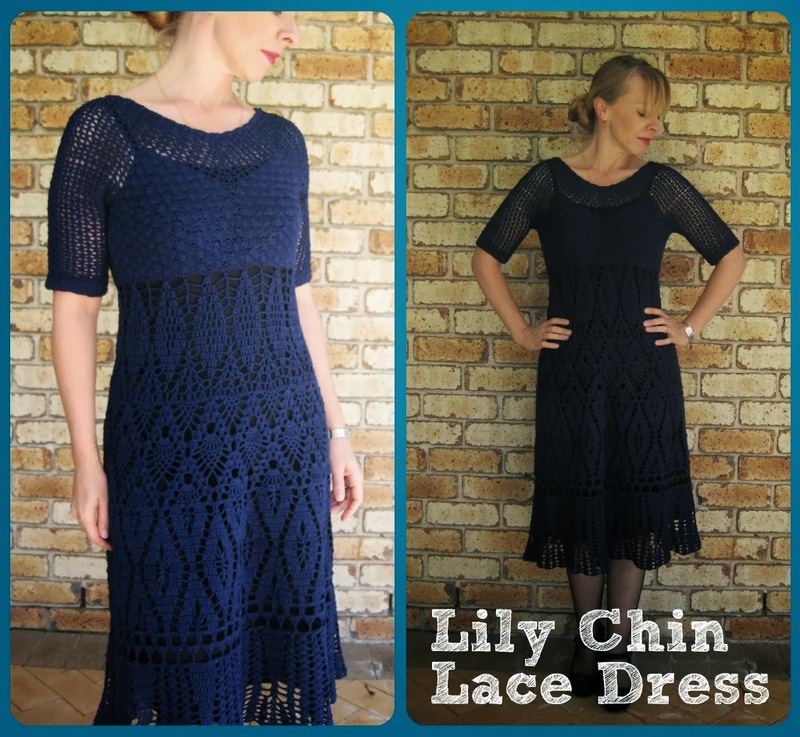 In 2013 I finally mustered up the courage to tweak it to be more wearable – I added sleeves to my own design (which took a number of attempts and redo’s to get right) and then dyed the dress a beautiful rich navy. I wear this dress often now and feel fabulous in it. I had fun and success this year sewing lots of Cake Patterns, fixing up some stuff I never wore, sewing with some lovely quality cotton from Japan and making dolls for my girls. All of my fails for the year relate to either bad fabric choice usually because I used really poor quality fabric or making an error with the fit which makes an otherwise great item unwearable. 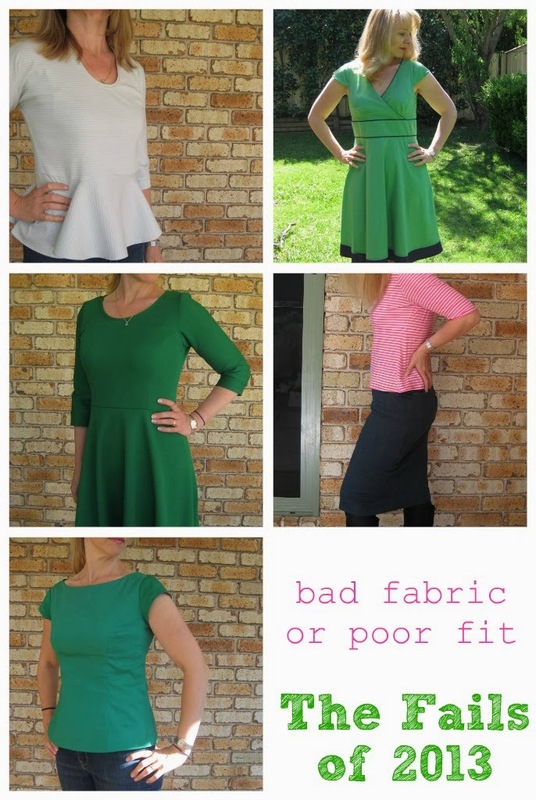 Top Row Left: My first Hummingbird top made in a too thick jersey and in a colour that looks terrible on me, also I was still working out how to get a kimono/cut on sleeve to work on my body shape and the fit is off = never worn. Top Row Right: Green McCalls 6011 – Awful Fabric, didn’t survive the first wash. This was indeed tragic as the dress WAS (RIP, dress) lovely. As soon as I find another fabric in the right shade of green I’ll attempt this again. Sob. Middle Row Left: My first attempt at the Lady Skater. I made a massive mistake in the bodice which meant the armholes were so tight the dress was really uncomfortable to wear. I cut off the bodice and this is now an awesome skirt, so it is not a complete fail. I really want to make a proper Lady Skater dress, as I love it. Middle Row Right: A rather dodgy too tight denim skirt that I wore once I think and then never again. I would need to lose about 10kg for this to fit me. Oopsy. And finally bottom row: My first attempt at New Look 6808 – Never worn after blog photos. I mean to make this again as I got the fit reasonably right, except for the armholes being too tight (a common problem I had this before before I finally clicked that when I take in at the shoulder I need to lower the armscye. Duh.). Those unintentional two toned sleeves just do my head in. And notice how many of my fails are green?